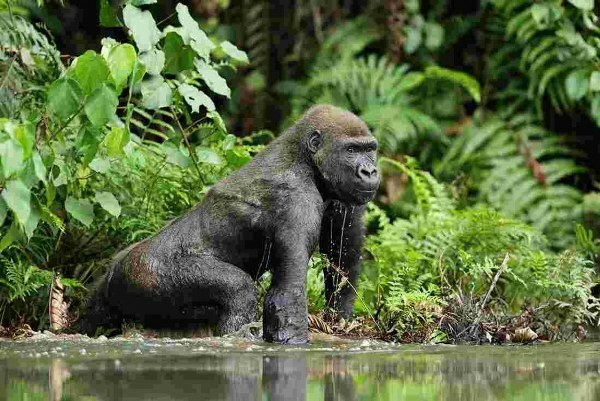 The 3 Days Lowland Gorilla trekking Safari in Congo Gorilla Tour is one of the highly rewarding safaris that will allow you to trek the stunning lowland gorillas in Khauzi Biega National Park. The park is the only outstanding protected area in DR Congo where you can encounter the endangered Low land gorillas in their serene environment. The tour will take you through interesting places like Tshibati waterfalls, Bukavu town, Mbayo tea plantations, the research Centre and will also allow you to have cultural walk to visit the traditional Congolese living in areas surrounding Khauzi Biega National Park in Bukavu. The Tour will start with pick-up from Kigali Air Port and end with drop off at the Kigali airport. Upon your arrival in Kigali international Airport, You will be welcomed by our driver guide who will transfer you Bakavu in Congo. The drive journey will take you through Butare, where you will have stopover to visit the national museum of Rwanda, the king’s palace in Nyanza, and the Rwanda genocide memorial site. Thereafter, you will proceed with the drive crossing via Cyangugu boarder to Bukavu in Congo. On arrival to Bukavu, you will advance with the drive to your pre-booked lodge in Bukavu for dinner and overnight. Accommodation: Orchid safari Lodge. (Luxury),Hotel Horizon (Mid-Range/Budget). After an early morning breakfast, embark on an early morning drive transfer to the park headquarters for an early morning briefing about the dos and don’ts of lowland gorilla trekking in Kahuzi Biega National park. After briefing, you will head for the memorable adventure of tracking the lowland gorillas in Kahuzi Biega National park. Trekking lowland Gorillas offers unique experience of its own and it usually takes 1-4 hours. The lowland Gorillas stay in bigger families as compared to mountain gorillas; you will not regret the safari effort once you meet the amazing Gorillas. After one memorable hour of encounter with the lowland gorillas, you will retire back to the lodge for lunch and relaxation. After lunch, embark on an afternoon nature walk in the Kahuzi Biega Park .The nature walks will take you through Tshibati waterfalls, visit Bukavu town, Mbayo tea plantations, the research Centre and the surrounding traditional homes. Thereafter, retreat back to the lodge for dinner and overnight.